DW: The Race is On! Mike and Laurence will be starting the 125 mile Devizes to Westminster Race at approximately 10:30 on Saturday morning, aiming to reach the end at around 07:00 on Sunday morning after a gruelling non-stop paddle. Their race number is 309, and you can follow their progress online. Final Update (Sunday morning): Sadly, Mike and Laurence had to retire from the race at Boulter’s lock, Maidenhead. A wrist injury incurred by Mike (and later, also by Laurence) meant that they were losing too much time over their schedule to make it to the tidal section of the river in time to catch the tide. It was a valiant effort, and they pressed on as far as they could despite their obvious discomfort. Six of us (I think!) will be chasing them down the river in three cars, feeding and watering them. They have decided (at the last minute!) to race for charity, in support of the Royal National Institute of Blind People. You can, if you wish, sponsor them by visiting this page. 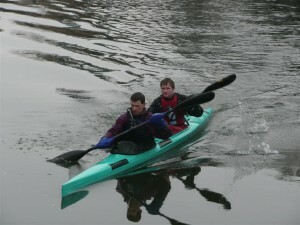 This entry was posted in Devizes to Westminster Race, News by admin. Bookmark the permalink. best of luck guys !! still a fantstic distance covered guys, well done ! !